Dan Wolfman was something of a Renaissance man. Trained initially as a mathematician at the Universities of Rochester and Chicago, he developed an interest in archeology during his graduate studies at Chicago. Upon completing his degree, he participated in excavations in Mexico and in the American Southwest for a number of years. In 1969, he took a position as a research associate at the Archaeomagnetism Lab at the University of Oklahoma, where Robert Dubois was developing a new archeological dating technique. Wolfman's reconstructed polar curve for the Arkansas region. Archaeomagnetic dating is based on the fact that magnetized particles that naturally occur in sediments, when raised above 570 degrees Centigrade (known as the Curie point), align in the direction of the earth’s magnetic North Pole as they cool. This altered magnetic directionality is called “remanent magnetism.” If the sediments have not been moved since the time of firing (or significantly disturbed by animal or insect burrowing, seismic activity, plowing, etc.) then they will record the direction of the earth’s magnetic North Pole at the time of the firing/cooling event. Importantly, the position of the magnetic North Pole shifts through time, about 0.2-0.5 degrees per year. The extent and direction of this shift is a product of differences in the rotational speeds of the earth’s inner and outer cores. The inner core is a solid sphere of iron that is approximately as hot as the surface of the sun. Surrounding it is the outer core, a volatile sphere of liquid iron rotating at a different and more variable speed. The dynamics of the relationship between these two inner components affect the earth’s geomagnetic field, resulting in what is essentially a wandering or migrating magnetic North Pole. Without delving into a mind-numbing treatise on geophysics, suffice it to say that it is possible to reconstruct the path through which the magnetic North Pole has wandered over previous centuries or millennia. The reconstructed path has a name: it’s called the Polar Curve, and it is the product of calculating and aligning numerous earlier pole positions that are referred to as “virtual geomagnetic poles,” or VGPs for short. 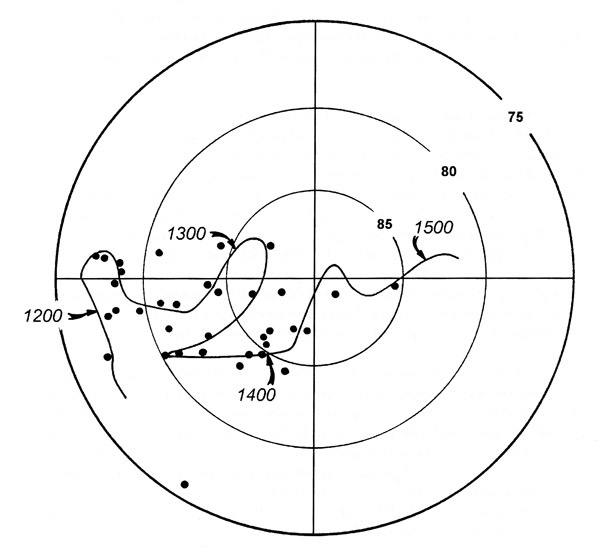 Therefore, if you are able to collect carefully oriented samples of fired sediments that can be linked to prehistoric activities (say, from a hearth at an archeological site), then by measuring the remanent magnetism in the sample you can determine where the magnetic directionality intersects the polar curve. And, if the polar curve itself has been dated, then you can determine when, in the past, the hearth was fired. Still with us? Good—back to Dan Wolfman. From Oklahoma, Dan went on to the University of Colorado to pursue a PhD in Anthropology, writing a dissertation that was based, in part, on the application of archaeomagnetic dating to reconstruct chronologies in Mesoamerican prehistory. He graduated in 1973, the year Ken Cole resigned his position at the Survey’s Arkansas Tech University research station to pursue other opportunities. Dan was hired to replace Ken. Once established in Arkansas, Dan began working to calibrate a Polar Curve reconstructed for the Arkansas region, using methods he had applied in the American Southwest (with Dubois) and in Mesoamerica. 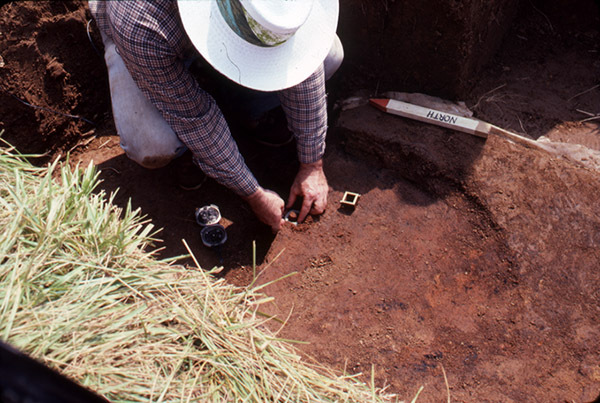 Dan Wolfman collecting an archaeomagnetic sample. Discussing how this is done requires a bit more information about the earth’s geomagnetic field. You can compare it to the very uniform magnetic field surrounding a dipole bar magnet. So, a theoretical bar magnetic extending from the earth’s south pole through the core and then to the earth’s north pole would produce a uniform magnetic field and, if the magnetic north pole wandered at all, its migratory path would look essentially the same from any spot on the earth’s surface. But, alas, the earth’s geomagnetic field is not accurately modeled by a dipole bar magnet; there are a series of perpendicular anomalies that produce irregularly distributed variations. Consequently, the polar curve takes on a different appearance, or trajectory, when viewed from different spots on the earth’s surface. The mathematics of these variations is such that polar curves need to be reconstructed for different regions (each about 500 square kilometers on a side) of the earth’s surface. Wolfman, of course, understood the math behind all of this. His first step was to collect oriented samples of fired sediments from a large number of features at archeological sites in Arkansas and Missouri (he began by collecting samples from more than 50 features). The remanent magnetism of these samples was measured in special lab facilities (one that he used frequently was at the Los Alamos National Laboratories in New Mexico). The next step involved accurate dating of the features from which the fired samples had been collected. In the Southwest, dendrochronology, or tree-ring dating, is used for this purpose and yields very high-accuracy results (in the best cases, archeological features can be dated to specific years or to a tight interval of a few years). In Arkansas, however, tree-ring dating is seldom possible at archeological sites, so radiocarbon dating is used. For this, selection of materials for dating is crucial: firewood charcoal from an unknown source found in association with a hearth, for example, yields a result less useful than dates acquired on charred nuts or seeds that were most likely gathered to be used as food during the same year and by the same people who built the hearth that a fired-clay archaeomagnetic sample was taken from. Wolfman collected a large number of oriented samples of fired sediments from archeological sites in Arkansas and Missouri. Using his fired sediment samples from archeological features along with paired, high-accuracy radiocarbon dates, Wolfman was able to reconstruct a polar curve for the Arkansas region and calibrate a chronology for points along the curve represented by each dated sample. Although work continues to refine the curve’s chronology, it is now possible to determine where a fired feature’s remanent magnetism will intersect the curve, and thus estimate a date of firing even if we have no accompanying radiocarbon date. Because of how well the dating of Arkansas’s polar curve is calibrated, archaeomagnetic dating typically yields results that have a +/- 10 to 20 year accuracy, in comparison to the +/- 50 to 100 year accuracy of a typical radiocarbon date. Dan left the Survey in 1988 to set up an archaeomagnetic dating lab at the Office of Archaeological Studies in the Museum of New Mexico. The lab became fully operational in 1993 and several samples from archeological sites in Arkansas have since been dated at that lab. 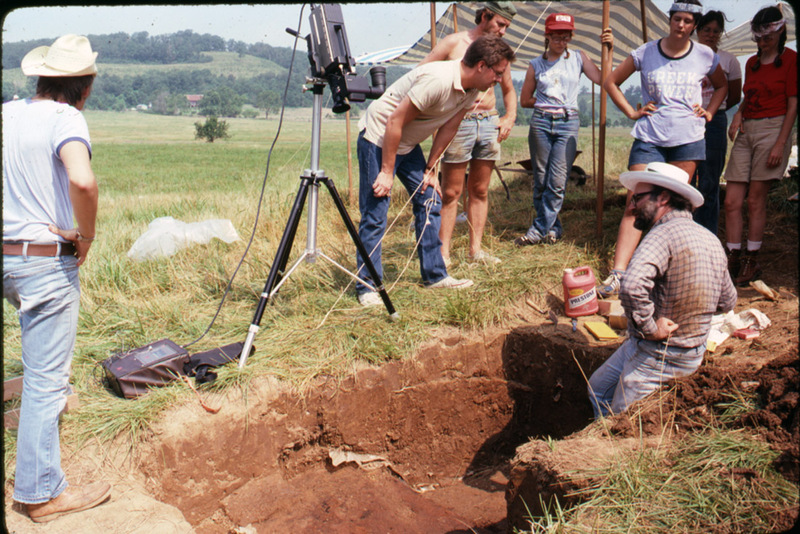 Unfortunately, Dan passed away in 1994, but his legacy of developing archaeomagnetic dating while at the Arkansas Archeological Survey remains an important part of our history and an enduring element of ongoing archeological practice nationwide.